How cute are these apple cake pops! I love that you can create a new dessert out of crumbled bits of cake. 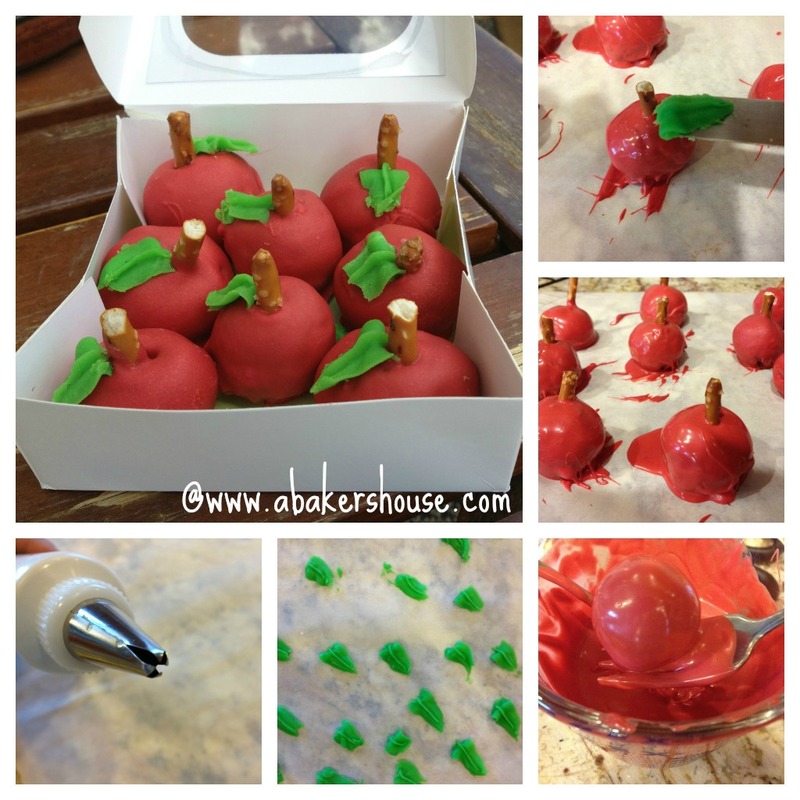 These apple cake balls turn into apples with dip of red icing and a pretzel stem. The cake pop craze continues! I sent these to my mom for her birthday. The idea is not a new one—check here for Bakerella’s apple cake pops and I am sure you’ll find others online—but the thought that this is easy enough to make in your own kitchen is worth the reminder. Start with cake or brownies, crumble them to pieces and add icing to the mix. (For full instructions check out Bakerella’s basic cake pop.) She is the queen of cake pops so there is no need to repeat what she has explained very nicely already. Form your “dough” into round balls, squishing the ends slightly to make an apple shape then freeze them for 20-30 minutes. In the mean time, pipe green leaves onto wax paper. Or you could find green candies that could make your apple leaves. Have pretzel sticks handy to use for stems. Melt your chocolate in the microwave or on the stove top with a double boiler. Coat the apple cake balls in the chocolate then place them on parchment paper or wax paper. Insert a pretzel piece for a stem and gently lay the green leaf on the cake ball BEFORE the chocolate sets. And there you have it—apple cake balls! These would be sweet for a classroom treat, a fall birthday party, teacher appreciation week or just for a plain old Tuesday! Looking for more apple treats? 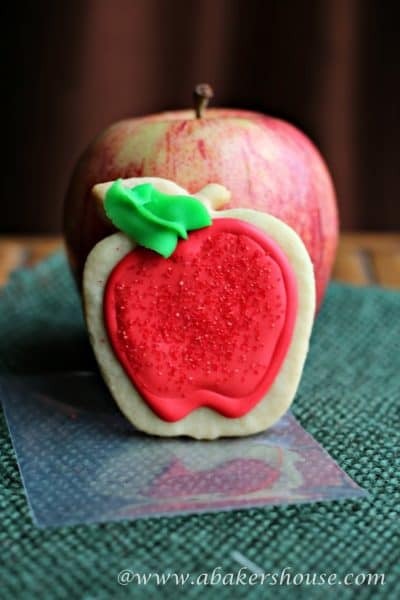 Try these Apple Cookies. Ohhhh these cake pops are ADORABLE!!!! What a cute idea, I absolutely love it! Thanks, Maria! I think I could easily become obsessed with making sweet little cake pops. They are so much fun! What a wonderful idea! I’m lucky if I can bake a cake, let alone these gorgeous little pops. 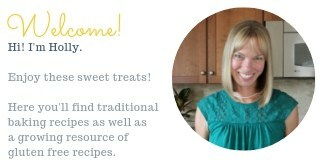 Thanks, Lea Ann, for stopping by! The best part about making cake pops for me is that the cake doesn’t have to turn out perfectly since it gets broken down to crumbs anyhow. Many a failed cake has turned into pretty cake pops in my kitchen! These are so cute and I bet just as delicious. I’m sure your mom love them. She did like them and they made it to her house nearly in one piece…or at least they were recognizable. Now I have to figure out how to package cake pops so that they make it through the US Mail. Thanks, Karen! Very cute indeed Holly. I wonder if bubble wrap would do the trick for shipping? I have a bunch if you ever want to practice! Yes, next time I will have to reinforce the packaging for sure. I’ve sent them before but usually just round cake balls– it was the pretzel stems that threw me off on the apples. Thanks, Barb! I would just pipe the leaves right onto the cake pops and not have to transfer it. I would break them. That is a great idea. My piping skills are questionable and I worried that I would pipe a silly looking leaf on the cake ball then be stuck with it if I did it directly onto the cake ball. I need more practice then I will take the route you suggested. Thanks, Charlotte! Looks like your cake pop skills are coming along. Truffles are always harder to dip and transfer without messing up the sides. I don’t like doing truffles because of it. I bet your mom loved them!